He smiled at sneers, disarmed hostility and when others scoffed he backed inventor John Logie Baird to the hilt. This is the story I am proud to tell, writes the "Belfast Telegraph" Television correspondent, ROBERT RAY. THIS is a story I am proud to tell. When you switch on your TV set to-night reflect on, these points: it was an Ulsterman who came to the aid of John Logie Baird, the inventor of television, when he was really up against it, restored his confidence and hope and assisted him in the formation of the company that gave the world vision by radio. It was an Ulsterman who helped and encouraged Baird in those early days of experiment and who travelled with him to the U.S. and European countries. Talking T.V. and explaining to most incredulous audiences the wonder of its possibilities. It was a Ulsterman whose face was the first in the world ever seen on a television screen. But back to the beginning and the opening years of the century when a young Belfast boy, Oliver Hutchinson, fresh from the city's technical school, set out for Glasgow and his first job as a motor engineering apprentice at the Argyll Motor Works. At the same bench was another prentice, a Scottish minister's son named John Logie Baird. They became friends'. Then, their training days over, t was not until the Great war that again Hutchinson by this time a Captain the 6th Royal Inniskilling Fusiliers, Baird also a soldier. IN the trenches the two former engineering apprentices talked of heir ambitions. Baird spoke of his dream-the invention of a system of relaying pictures through the air and Hutchinson, a mechanical genius in his own right with a great future ahead in civilian life, of his plans. But he was a good listener, too, and he was fascinated by the idea of television. The end of hostilities brought another parting. Hutchinson returned to his base, now in London, and prospered in various commercial enterprises. A few years later he was walking own the Strand when he noticed a familiar figure on the crowded pavement. He paused, looked and looked again. It was Baird. hey went for a cup of tea and they talked-or Baird talked. He had been working on his dream, those pictures that could be sent through the air. Only now, it was o longer a dream. He knew he could do it. He had mastered the principle. The Ulsterman who was again the listener, patient, sympathetic, intelligent, had other ideas. Television was Just beginning. Within a few weeks he had given Baird back something he thought he had lost for ever-faith in humanity and the courage to go on. And he had also provided him with the funds to purchase equipment and set up research studios. But make no mistake about this. Oliver Hutchinson was no idle, rich, sleeping partner backing a great man-and Baird was a great man-with an inventive ideal. Hutchinson could speak Baird's own language, could, and did, help him with his intricate problem. They worked together, these two until that memorable day in 1926 when at his first demonstration it was the Belfast man's face that was Televised- the first true T.V. picture in the world. Who was this Oliver Hutchinson? A son of the late Mr. and Mrs. Samuel Corbett Hutchinson, of Combermere House. Hillsborough (County Down), he was born and educated in Belfast, and died in April 1944. His brother, the late Captain S. J. Hutchinson, was for many, years a director of J. B. Ferguson, Ltd., Chichester Street, and also of another well known motor engineering firm, Hutchinson, Haddow and Co., Ltd., of Oxford Street. Living in Belfast to-day are his three sisters: Mrs. Samuel Leith, 57 Edgecumbe Gardens-her son, Dr. J. D. F. Leith is Editor of "The Medical World"---Mrs. A. Johnston, 6 Wandsworth Road, and Mrs. J. G. Connor, 29 Orpen Road, Finaghy. It was from Mr. Sam Leith that T heard much of Oliver's story, which, if I may drop a hint to the B.B.C., should surely be of very special interest to their programme planners. But perhaps you feel the tale would come better from someone not in anyway connected. with the Hutchinson family. "When the story of television comes to be written the name of Oliver George Hutchinson will be emblazoned therein at the one great power who translated the new science from a big idea into big business. "Geniuses are repeatedly un-commercial, " Moseley went on. "But John Logie Baird is somewhat of an exception for a more level-headed man it is impossible to meet. Nevertheless he will be the first to admit that without the vision, the extraordinary energy, the intense belief and thorough going business mind of this man Hutchinson, television in Europe - certainly in England - would not have advanced to the position occupies to-day. "The Gods were indeed in happy mood when they threw these two together . . Baird, a ro** genius whose ideas chased another with such rapidity that he had no time-indeed if he had inclination-to convert them into practice; Hutchinson of inexhaustible energy, a fighter to the last ditch. "Pioneers of science are usually left high and dry when it comes to cashing in, but Captain Hutchinson has proved himself to be a loyal colleague all through. "Once realising, as he did so instantaneously, the germ of Baird's television idea, he seized upon and wrestled with a world of sceptics, astonishing a centre who one used to think had no more room left for surprise--The City. 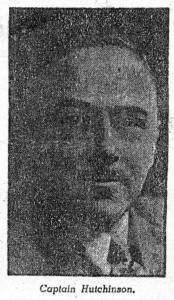 "Later, London was the first to pay tribute to the business genius of the young Ulster man who had smiled at the sneers and disarmed the hostility as and when he met it"
MOSELEY'S story goes on to tell Hutchinson formed the company and became joint managing director the Baird Television Development Company and how he induced some of the soundest men in the world. Lord Ampthill and Sir Edward Manville to join him and Baird on its Board. And Moseley finishes like this, "The present position of television in England and Europe generally is such that Hutchinson can afford to look back with placidity and pride on work nobly done." "The tributes that reach London in regard to the work accomplished for this science show his reputation has become world wide." So there you have it. Television In your homes-and a fair amount of the credit due to a man from Northern Ireland.